4So Abram went, as the Lord had told him; and Lot went with him. Abram was seventy-five years old when he departed from Haran. 5Abram took his wife Sarai and his brother’s son Lot, and all the possessions that they had gathered, and the persons whom they had acquired in Haran; and they set forth to go to the land of Canaan. When they had come to the land of Canaan, 6Abram passed through the land to the place at Shechem, to the oak of Moreh. At that time the Canaanites were in the land. 7Then the Lord appeared to Abram, and said, “To your offspring I will give this land.” So he built there an altar to the Lord, who had appeared to him. 8From there he moved on to the hill country on the east of Bethel, and pitched his tent, with Bethel on the west and Ai on the east; and there he built an altar to the Lord and invoked the name of the Lord. 9And Abram journeyed on by stages toward the Negeb. Today is the day in the church year that has come to be known as Stewardship Sunday. Those of you who have been in the church for many years are probably rolling your eyes, but for those of you who might be new to our ways, let me explain. In years gone by, at this time of the year church leaders would come before the congregation and say something like, “We have been putting together a budget for the coming year. Costs are going up, there are some projects we need to do, and some new things we would like to do. So, we think our expenses will go up by about 5% next year. So, we need you folks to give 5% more than you did last year. How much are you willing to give to keep the church going this coming year?” And then, based on what people were willing and able to give, the budget would be accepted or adjusted. Remember that in our church tradition, most congregations do not receive regular support from wider church bodies. We get some income from fundraisers (like our Turkey Dinner, thank God! ), and from groups who use our building (like our friends in the Westminster Orthodox Presbyterian Church), but for the most part it is up to the members and friends of the church to support the ministries of the church: building, staff, programs, and mission. The concept of stewardship is more of a faith-based reason for what we ask people to do. It’s not just fund-raising. It’s not just begging (although sometimes it can devolve into that). It is about the belief that God has given us gifts – of many kinds – in part for our own use, but in part to share. Some of those gifts include the gift of life itself, the earth on which we live, the people who share our lives, financial resources, abilities, time, and others. Part of our responsibility as Christians is to use those gifts wisely – to be good stewards of the gifts that God has given us – by giving them back to God for God’s ongoing work. Stewardship. It is about more than just giving to meet a budget – to keep a church going. Or at least it is in living, vital churches. We are part of a faith journey – a faith story that goes back thousands of years to our ancestor Abram/Abraham. Now this is a fascinating story in the book of Genesis. It begins when Abram was 75 years old. We don’t know a lot about him before then. We don’t know if he believed in and worshiped God before then. We don’t know if he was happy in Haran or not. It sounds like he had accumulated some things, but we all know that having a bunch of “stuff” doesn’t necessarily make one happy. We know he was married – to Sarai/Sarah – but they had no children. So maybe Abram was looking for something – something truly important, something deeper. Maybe he was having a mid-life crisis (at 75!). And maybe that is the beautiful thing about having very few details in this story – many of us might see ourselves in Abram and Sarai. They had been blessed, but they were looking for something more. I have said before that one of the things I have always wondered about this story is why God chose Abram. No reason is given. He wasn’t necessarily the best man who ever lived. If you read the rest of his story, you learn that he had his moments of profound faith, but also moments of bad decisions. Maybe God knew Abram was looking for something new. Or maybe God had tried calling many other people before Abram, but none of them listened or responded. But Abram listened to some amazing promises that God made: “I will make of you a great nation, and I will bless you, and make your name great…” Imagine – to be powerful and fruitful and wealthy and famous! What more could one ask? Abram responded. And although it took some time, he and Sarai did eventually have many offspring, and a land of their own in which to live. They became the ancestors of the Jewish people – the people of Israel; God’s “chosen” people. And thousands of years later, Christian believers became a part of God’s people through their faith in Christ – heirs of the blessings and promises of God. But Abram and his descendants were “chosen” and blessed to be a blessing. They weren’t special or more deserving, they were a starting point. Through them, the blessings of God were to overflow to other nations – and eventually to all the world. God said to Abram, “In you all the families of the earth shall be blessed.” But throughout their history the people of Israel got into trouble when they forgot that – when they forgot that it was God who had blessed them, and saved them countless times. They got in trouble when they forgot that they were to be a blessing to others. Blessings were to flow from God, through them, to others. I think part of Jesus’ criticisms of the Jewish leaders of his time (Jesus was Jewish) was that they had forgotten that part. It wasn’t all about them. They were to be a blessing to sinners and tax collectors, widows and orphans, lepers and demoniacs, Samaritans and Gentiles. We are here today because, through the grace of God and the self-giving love of Jesus and the power of the Holy Spirit we are a part of God’s chosen covenant people. We have been blessed – so that we might be a blessing. We have been blessed. We are alive! We are here! We may not always feel like it when we look around and see people who seem to be more blessed than we are, and when we have to struggle and worry about keeping up our lifestyles, but most of us are among the wealthiest people in the world! So why aren’t we all living in ease, without a care in the world? But we are blessed with much more than material gifts. We are heirs of God’s promises. We are loved! We worship a God that is truly eternal and powerful and good, and who can save us from futility and despair better than any political party can. God is with us in good times and in hard times, and can save us when all hope seems lost. We are a community of people who care about us. We are offered faith and hope and love, which are much more valuable than gold. We have received the promise of eternal life! You can’t buy these things. You can’t earn them. They are a gift – a gift for which to be grateful, and a gift to be shared. We are blessed… to be a blessing. Among those blessings are financial gifts. God knows that we need things to live: shelter, food, clothing, transportation, healthcare, education, etc. But we live in a world that constantly tells us that life will be better if we spend more: buy as much housing as you can afford; people will love you more if you spend more money on a better car, or nicer clothes, or making yourself more beautiful. And now that you have that stuff, you need to worry about keeping it – and what possible disasters might strike in the future? And you can’t really trust in God about any of this – it’s all up to you. So the way the math works out according to the world is that whatever you have isn’t enough. But God says, I have blessed you to be a blessing. And God’s math works this way: For every $10 I bless you with, you get to keep $9 for yourself and your own needs and enjoyment. It will be enough if you don’t listen to all that advertising nonsense and your own fears. The other $1 (10%) is one of the ways that you bless others. Blessed to be a blessing. That is stewardship. And it’s at the very start of our faith journey. It is how we live our faith; it is how we grow our faith. Wanting to be blessed by God without being a blessing to others is like wanting to be loved without loving others in return. So here is your chance to be a blessing to and through the church. We should have for each family a stewardship letter and pledge card for the coming year. It’s time for you to have a sit-down conversation with God to take stock of how you have been blessed, and how you can be a blessing. 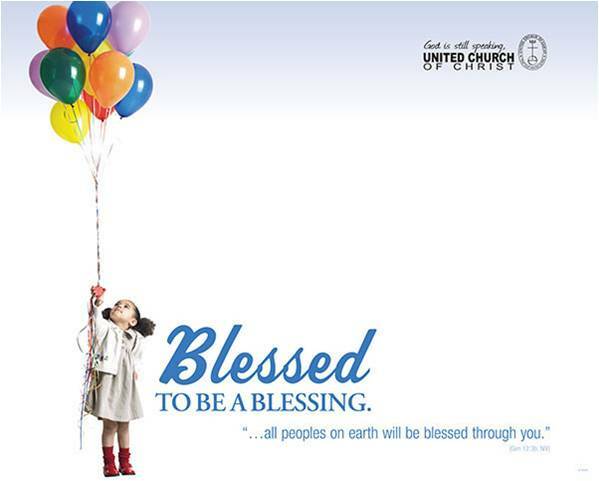 There is an insert in your bulletin with another stewardship message and a handy chart to help you determine what being a blessing might look like for you. This isn’t just about the church – there are other ways to be a blessing other than through the church, but the church has the unique mission of inviting more people to experience the blessings that God offers, and to be a blessing to others themselves. We need your financial gifts to help us do that, but we also need your ideas and wisdom and love and hard work to be sure that we are using the gifts given to the church in the most effective ways to proclaim the good news of the gospel. Two weeks from now – on November 23, the date of our congregational meeting – you will be invited to join us for worship and offer your pledge card blessings to God. If you can’t be with us on that day, you can mail them or bring them in to the church office. Between now and then, we will hear from some folks about why they give to the church, and you will see how the church has been and is a blessing for many. Happy Stewardship Sunday – the best Sunday of the year! This entry was posted in Sermons on November 11, 2014 by lyonsvillechurch.